July 7, 2017: With GST kicking in, prices of the Hyundai i20 Active have been revised. Based on pre-GST taxes in your location, the ex-showroom price may have either gone up or down. Mumbai: The starting price for the faux-crossover now starts at Rs 6.72 lakh, as opposed to Rs 7.14 lakh. That's a difference of Rs 42,000. Prices have been slashed across variants. Delhi: The starting price for the faux-crossover now starts at Rs 6.68 lakh, as opposed to Rs 6.78 lakh. That's a difference of Rs 10,000. Prices have been slashed across variants. Hyundai i20 Active prices start at Rs. 7.71 lakh for petrol and goes upto Rs. 8.80 lakh. The prices of i20 Active diesel variants start at Rs. 9.91 lakh and the top-end diesel is priced at Rs. 9.91 lakh. Hyundai i20 Active is available in 4 variants and 7 colours. Share your experiences with i20 Active? The claimed ARAI mileage for the Hyundai i20 Active petrol is 17 kmpl, and for the Hyundai i20 Active diesel is 21 kmpl. The Hyundai Active i20 comes with a plethora of features and great looks. It also comes with a great set of engines and overall performance and comfort that might make this another winner for Hyundai. Q. I am driving Santo car since 2009. Is i20 Active more powerful and comfortable than the Santo car? Q. Which is the best car in 2019 and low price? Q. I am using Wagon R since 10 years now I want to change which is best option my budget is 8 lakh to 10 lakh. Q. I am presently using Hyundai i10. It is now more than 10 years. I want to change. My budget is around 8 lac. Which car is better in view of I drive daily to go office? I don't want a maruti car. Q. There is water leakage in my boot space while it rains there was no damage to my car from outside but it still gets wet inside boot space . What could be the possible reason? We would suggest you get in touch with the authorised service centre as they will be the best people to aid you in this concern. Can a compact SUV like the Maruti Suzuki Vitara Brezza be a worthy alternative to a family sedan like the Honda City or a premium crossover hatchback like the Hyundai i20 Active? Looking for a crossover hatchback? We tell you if it's worth waiting for the Maruti Suzuki S-Cross or should you book the Hyundai i20 Active. Hyundai is the latest car maker to enter the crossover hatchback segment with the i20 Active and it is has a pretty impressive package too. But will it hold its own against the Toyota Etios Cross and the Fiat Avventura? The Hyundai i20 Active was probably the first cross-hatch that made its segment popular. Launched back in 2015, it is still one of the best in the segment and strikes a sweet balance between being more bad road-capable and everyday driveability. Hyundai has constantly been updating it from time to time, so it has all the bells and whistles you expect of a modern car. However, the new facelift-based i20 Active should be here around the end of the year and is eagerly awaited. No matter what angle you choose to look at the i20 Active from, it is obvious that underneath lies the Elite i20. To set it apart, though, the Active gets new bumpers, wheels, body cladding and roof rails. It even wears a silver faux skid plate to accentuate the off-road ready look. The 20mm higher ground clearance (190mm) of the Active becomes apparent from the side profile. And even though the rim size is the same, the chain-link alloy wheels make the car look tougher. Overall, the added bits and elements give the Active a muscular look, but not enough to make it look like a proper crossover, say like the Honda WR-V. In terms of features, the Hyundai i20 Active comes with keyless entry, a multifunctional steering wheel, Bluetooth connectivity, touchscreen infotainment unit with 1 GB internal memory, digital climate control and a reversing camera. It also gets automatic lights, ABS, airbags, cornering lights and aluminium pedals. The Hyundai i20 Active comes with a 1.2-litre Kappa Dual VTVT petrol engine and a 1.4-litre U2 CRDi diesel engine. The petrol engine produces 83PS of power and 114Nm torque, mated to a 5-speed manual transmission. The diesel engine, on the other hand, produces 90PS of power and 219Nm of torque and comes mated to a 6-speed manual gearbox. The base-spec petrol variant retails for Rs 6.99 lakh while the top-spec SX dual-tone costs Rs 8.66 lakh. The top-end diesel SX, however, retails for Rs 10.0 lakh (ex-showroom Delhi). Fiat Avventura Urban Cross: With an improved interior, chrome garnishes on the exterior and the removal of the ever unpopular boot-mounted spare wheel, Fiat is calling the Avventure, the Urban Cross. Everything else remains the same. Honda WR-V: The WR-V is not a Jazz on steroids. It gets more practicality with a higher ground clearance, digipad infotainment system and a sunroof. Doesn’t everyone want a sunroof in their lives? Toyota Etios Cross: A beefed-up Liva hatchback, the cross is targeted at other faux-crossovers listed above. But it remains a cosmetic job with a higher ground clearance. The Hyundai i20 Active is a good looking car, but fails to pull a proper cross-hatch image. It is loaded with features and the fact that it is based on the Elite i20 speaks volumes about its comfort and reliability. The only thing that remains to be seen is when Hyundai will give it a facelift, like the Elite i20. Seriously, this is the new one. The Honda WRV has been launched in India, how does it compare to other hopped-up hatchbacks in the segment? 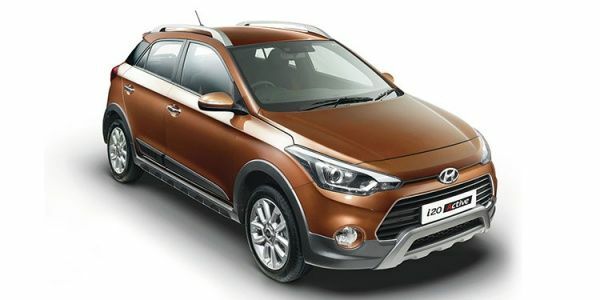 Confused about Hyundai i20 Active?